Calming the Storm: Toronto gears up to take the lead in wet weather management. The last thing a city with world-class ambitions wants is to be recognized for its polluted waterfront. So it was in 1987, when pollution led the City to post warnings along Toronto’s beaches, earning the city a spot on the International Joint Commission’s list of 43 Areas of Concern in the Great Lakes basin. With 2,600 storm sewer outfalls and 80 combined sewer overflows, Toronto’s water pollution problems were legion, particularly after sudden or heavy precipitation. The City took action in 2003 with the Wet Weather Flow Master Plan, a 25-year, $1-billion strategy to tackle polluting stormwater overflows and protect Toronto’s natural waterways. Already, four large stormwater management ponds have been built at the mouth of the Humber River, trapping, filtering, and cleaning stormwater. Close to the crowded downtown core, a storage tunnel intercepts stormwater and combined sewer overflows, while underground tanks accomplish much the same along the eastern beaches. Crews have stabilized banks and stimulated new growth along Highland Creek near the Scarborough Bluffs. They recently completed a stormwater management pond at Earl Bales Park in the city’s north end. Not only does this stand to treat runoff and improve water quality in the West Don River, which feeds the larger Don River and, ultimately, Lake Ontario, but the city will reuse collected stormwater to supplement the irrigation and snowmaking needs of an adjacent golf course and ski hill. An environmental assessment is underway, meanwhile, for the Don and Central Waterfront Project. With planned underground storage tunnels and tanks and a treatment facility, this signature component, alone, will address some 50 combined sewer overflow discharges to the Lower Don River and along the inner harbour. 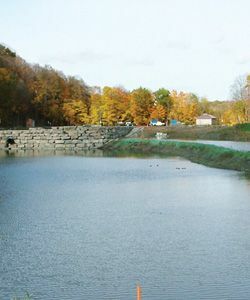 Over its 25-year scope, the master plan calls for some 180 stormwater ponds and 90 underground and sub-surface storage tanks and tunnels, along with other, softer stormwater diversion measures such as basement flooding prevention and mandatory downspout disconnections programs, both of which are already underway in key areas of the city. Some critics have asked why the city isn’t separating storm and sanitary sewers. Michael D’Andrea, the city’s director of water infrastructure management, says the master plan acknowledges that stormwater becomes contaminated when it lands on our modern concrete jungle and mixes with animal feces, exhaust and fluid residues from vehicles, and other pollutants. The master plan views the ecosystem as a whole and budgets the work into manageable slices costing roughly $40 million per year. Thus far, city council has expressed ongoing support for the overall approach and planned measures. Political buy-in is vital because water and sewer projects are largely financed through water revenues, and other infrastructure demands and emergencies can put pressure on longer-term projects.